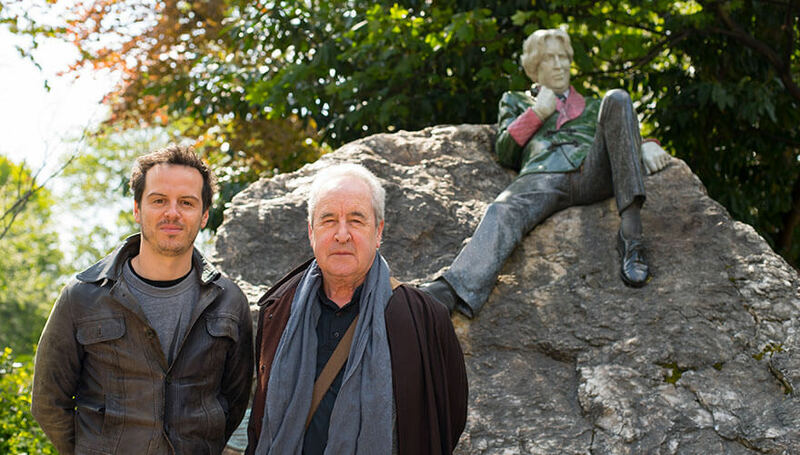 Ten of Dublin’s most eminent statues have been given a new lease of life – and a voice – thanks to a project called Talking Statues by Failte Ireland with support from Sing London and Dublin City Council. Dublin is a city with a rich past. 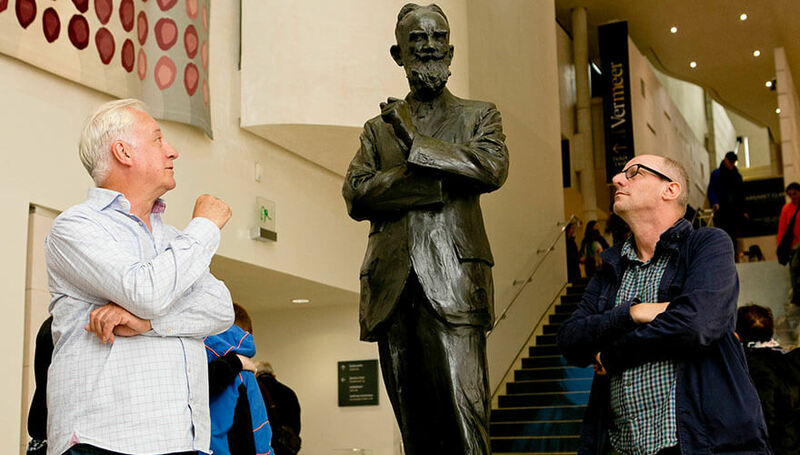 Its history is full of humour, folklore and, most of all, characters – many of whom have been immortalised as statues. They stand in parks, on street corners and in galleries. They connect us to a time gone by, and they all have a story to tell. But when was the last time you stopped to look at a statue? Or gave a moment’s thought to who it portrays and why it’s there? Talking Statues helps us to remember the achievements and ideas of the people who were turned into stone or bronze. It keeps their stories alive using an artfully crafted monologue delivered directly to your phone. Just scan a QR code near the statue, and James Joyce or even Cúchulainn will give you a bell. I can assure you that it takes communing with a statue to a whole new level. Each of the statues that feature in the project was required to meet specific criteria before it was given a voice. Colette Hiller, Art Director of Sing London, explains that “footfall, the proximity of other statues and the potential for telling a good story” were all taken into consideration. After the statue is chosen, it’s time to match it with the actor and writer – and this project has a phenomenal cast list. The voices of some of our finest actors – Gabriel Byrne, Brenda Fricker, Brendan Gleeson, and Ruth Negga among them – bring these statues to life. Their scripts have been written by some of Ireland’s greatest contemporary writers, including Roddy Doyle, Paula Meehan and John Banville. So why not answer a call from James Joyce from the streets of “dear dirty Dublin”? Listen to him recount how he’s often mistaken for Charlie Chaplin or a spray-painted mime artist as he stands on North Earl St “taking it all in”. Your experience of the Daniel O’Connell monument will be an unusually moving and powerful one if you listen to Ruth Negga in the role of Fidelity, one of the beautiful winged women at the foot of the statue. She has her very own story to tell. 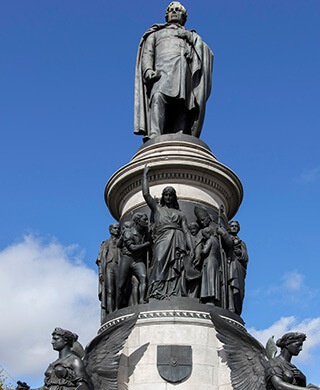 And as people, bikes, buggies and buses zip past, what stands out here is the connection you feel – not only to the statue but also to the people of Dublin and the public spaces that we all share. Then it’s a just a short stroll to Jackie McKenna’s 1988 bronze sculpture Meeting Place (or ‘The hags with the bags’ as it’s known locally), near the Ha’penny Bridge. This one really shines a light on everyday life in the city and is sure to leave you with a smile. 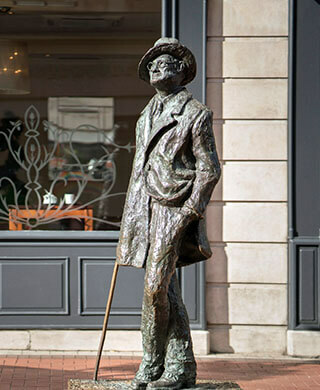 “Using drama, humour and technology, we’re breathing new life into statues have been too long overlooked,” says Keelin Fagan, Head of Dublin at Failte Ireland. It’s true; there’s something quite magical about making a statue speak. And soon it could be your chance. This February, look out for news of a competition inviting the public to submit their ideas for monologues for two more monuments: Jeanne Rynhart’s Molly Malone on Suffolk Street and Eilís O’Connell’s shiny abstract Apples and Atoms on Trinity campus. What could Molly – or an arrangement of stainless steel spheres – do with a good script and an iPhone 8? Dublin.ie can’t wait to find out.